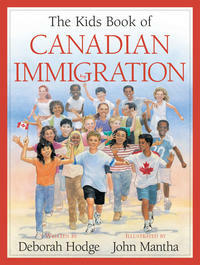 These books support the Grade 6 Social Studies topic of Heritage and Canadian identity. They spotlight communities in Canada, past and present, and the contributions of various ethnic and religious groups to Canadian identity. Interwoven are the concepts of cause/consequence and continuity/change. 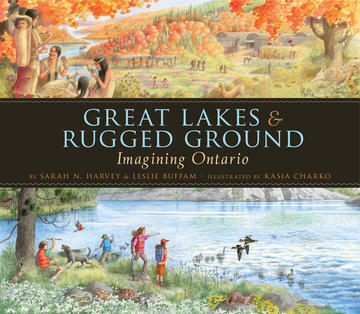 Great Lakes and Rugged Ground: Imagining Ontario, by Sarah N. Harvey and Leslie Buffam, illustrated by Kasia Charro, is a must-have. It depicts a changing landscape, in 14 panoramic scenes and 14 playful haikus, encapsulating heritage moments in Ontario. Beginning with the Haudenosaunee in the mid-1500s, this non-fiction picture book shows Europeans meeting First Nations, the Loyalists’ arrival, Laura Secord, the War of 1812, and the influx of Irish workers on the canal system, and in lumber mills. Other topics include the railway, the mining industry, the Group of Seven, women’s role during WWII, and the formation of the Toronto Maple Leafs. There’s also a scavenger hunt at the back for readers to find details in the illustrations. 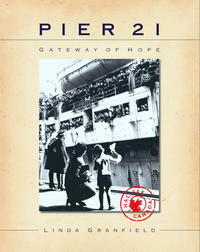 Pier 21: Gateway of Hope, by Linda Granfield, is a primary source for students investigating how it felt to immigrate to Canada, from 1928 to 1979. It’s essentially a photo album of unidentified families, displaced persons, Home Children, war brides, and soldiers entering Canada through the Halifax immigration facility. There are photos of ship interiors, various passports and “labels” worn on the lapels of newcomers nervously awaiting acceptance. The extraordinary facial expressions and teddy bears next to large trunks invite inferencing, empathy, and a discussion of point of view. Granfield writes of newcomers being given a “ditty bag” (care package) upon entry, which included corn flakes. Many had never seen dried cereal; some emptied the box looking for its “real” contents, thinking the flakes were filler. Others thought it was too like the chicken feed from home. Statistics at the back of the book tell which countries came during which years. There’s also an anecdote about a French boy in 1949 drawing a picture of peas for the ship’s waiter to communicate his needs. That boy turned out to be Michael Martchenko, the now well-known Canadian children’s illustrator. 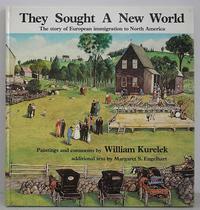 They Sought a New World: The Story of European Immigration to North America, by Margaret S. Engelhart, illustrated by William Kurelek, would make a good read aloud. Kurelek’s detailed paintings are accompanied by his personal observations as a Ukrainian settler. Engelhart’s comprehensive account of how Canada was shaped by waves of newcomers addresses why they left Europe, what they encountered when they arrived, the challenge to find work, land ownership, and the obstacles children encountered in English-speaking schools. Passages also include the role of religion and customs brought from the “old country” and finally how only some Europeans became successful and independent in Canada. The Kids Book of Canadian Immigration, by Deborah Hodge, illustrated by John Mantha, brings to life the complex development of Canadian communities. Part of the Kids Can series, each large 2-page+ spread showcases waves of immigrant populations, such as the Irish, Ukrainian, Polish, Dutch, German, Italians, Underground Railway passengers, Mennonites, prairie settlers, and refugees. All are placed on a timeline, with a brief overview of who/why/how they came, and personal accounts. The book highlights contemporary Canadians from a variety of backgrounds who have made significant contributions to Canadian identity. It explains closed immigration policies during the war years (1914-45) that discriminated against particular ethnic groups, including Blacks and Jews. In 1962 laws changed, which helped create the multicultural society we know today. Included is a pie-chart breaking down the number of first, second and third generation Canadians. 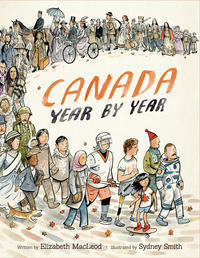 Canada Year by Year, by Elizabeth MacLeod, illustrated by Sydney Smith, will inspire students to interpret patterns and trends beginning with Confederation. MacLeod divides history into significant 10-20 year periods, i.e. wartime, depression, boom years, digital age. She highlights a milestone for each year, covering politics, art, sports, culture and Canada’s participation in world events. The book includes those often marginalized in history books: women, Indigenous peoples and those with disabilities. Along with sidebars, quotes, interesting facts, and bios, Smith’s illustrations complement MacLeod’s accessible writing, making abstract events concrete for the young historian. Part of the curriculum addresses features (such as architecture) that characterize a community and how these features contribute to identity. 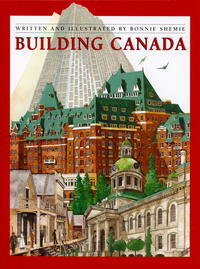 Building Canada, by Bonnie Shemie, spans 400 years through precise watercolour paintings of significant buildings. Children will recognize key buildings on this graphic timeline of architectural styles brought from other countries, adapted to Canadian weather. The book begins with New France (1600) and ends in the year 2000, explaining why many Canadian bank buildings took on a neo-classic style, why the false “boom town” fronts in the prairies came about, and why train stations, hotels (Banff Springs), government (Parliament buildings), and commercial buildings (Hudson’s Bay) look the way they do. “The way we build is a reflection of our values,” says Shemie in her conclusion. There’s also an architectural glossary at the back. Can you imagine Canada without parks? 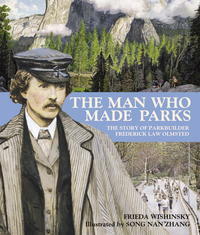 This non-fiction book, The Man Who Made Parks: The Story of Parkbuilder Frederick Law Olmsted, by Frieda Wishinsky, illustrated by Song Nan Zhang, reads like a picture book. Frederick was born in Connecticut in 1822 and he loved the outdoors, had a multitude of careers but was undecided of his future at age 35. He was most impressed by the parks in England. The focus of this book is about the creation of his first project, Manhatten’s Central Park, but the significance of his impact on Canada, is addressed in his designing many parks, including Mount Royal and the rim of Niagara Falls. The next four fictional books about the railway help children understand the consequences of historical periods. 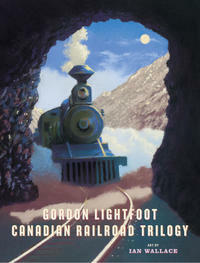 Canadian Railroad Trilogy, by Gordon Lightfoot, illustrated in chalk pastels by Ian Wallace, is a large format pictorial representation of the song commissioned by the CBC in 1967. Each page shows a lyric, beginning with forests, early explorers, and First Nations. Through the use of symbolic elements (i.e. Chinese characters referencing Chinese labourers who died) and literal elements (i.e. trestle bridges and rail spikes), the illustrations portray both positive and negative aspects of this time in history. The musical score is included at the back, as well as notes on each illustration by Wallace and a brief history of the CPR. 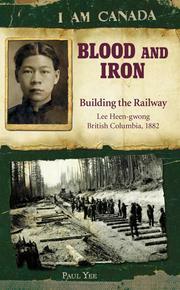 Part of the "I Am Canada" series, Blood and Iron: Building the Railway, Lee Heen-Gwong, by Paul Yee, is very compelling. A great read aloud the size of a pocket diary, it’s based on the real-life journal of 14-year-old Heen-Gwong, who travelled from China to British Columbia in 1882 with his father. Over the course of the book, the reader follows Heen on a difficult overseas voyage, where his father gambles away their future wages. Heen works felling huge trees, clearing boulders exploded by the Red Beards (paid twice as much as the Chinese) and building up the road bed for railway ties. This is a coming-of-age story, about a son and his problematic father, working under dangerous conditions, and trying to earn money despite unforeseen costs. In the end, Heen is fired at age 16, along with 3000 Chinese workers left in Canada without any means for passage home. The epilogue outlines what happened to real-life Heen, along with photos of Chinese workers, a historical note, glossary and a bit about how Paul Yee came to write this book. 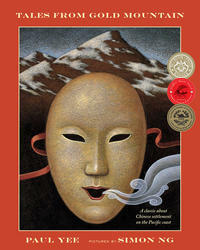 Yee also wrote Tales from Gold Mountain, Stories of the Chinese in the New World, illustrated by Simon Ng. These eight stories address issues of the time, such as honouring those who died on the railway with a proper burial; the struggle to establish a place in the merchant trade; the role of friendships made on the ship over; the questioning of old customs; gambling; mistreatment of workers in the fish canneries. Each original, engaging story has a lesson to teach and each provides a glimpse into Chinese struggles during the Gold Rush. 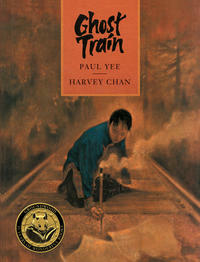 The Ghost Train, by Paul Yee, is beautifully illustrated by Harvey Chan. Choon-yi was born with the gift for painting, even though she was born with only one arm. Her father leaves to help build the railway in North America and he summons her, telling her to bring her paper and paints. She arrives to discover he has passed away while on the job. Her father’s spirit cannot rest until Choon-yi rides the ghost train, meeting all those who died building the railway, and paints their untold stories.